Coalition politics. Insurgency and counterinsurgency. Human rights abuses and war crimes. Technological adaptation and innovation in the face of security challenges. These may seem like themes ripped from events in a post-9/11 world but as we walk the hedgerows in Normandy, France reflecting on this D-day anniversary we see the past and the present. In partnership with Normandy Allies, a non-profit organization which provides logistic and educational support for those wanting to learn more about the events associated with D-Day and Operation Overlord, 16 students and I have the unique privilege of being in Normandy on this D-day anniversary. This trip allows students to get a sense of history they could never have picked up in the classroom. It is one thing for students to learn about war in the classroom but it is another thing entirely to learn about it in front of a wall pock-marked by German bullets used to execute a teenage boy in the French resistance, or to talk with a decorated American veteran who, at 19, floated to earth in a hail of gunfire so that he and his brothers could shed their blood to liberate those under the yoke of a totalitarian regime. During the trip, students learn about the strategic, operational and tactical levels of the conflict via readings and a series of staff rides to many of the numerous battlefields of Normandy. They also meet and discuss the war and its consequences with American, British, Canadian and French veterans of the war, as well as many French civilians and resistance fighters who suffered as the battle raged around their homes. While we are here we will also engage in a number of citizen diplomacy efforts too, joining French veteran and civic groups in laying wreaths on the monuments commemorating the sacrifice of American soldiers. On this anniversary day we’ll attend official ceremonies of remembrance occurring in the British and American sectors. This year, students are in the VIP section for a speech made by recently elected French President Hollande. Many of these students are war veterans themselves and for them this trip can be truly cathartic. I see them reflect on their own service and connect it to the battles of past generations. When I talk about war and security in my classes, it is not just an academic exercise. This trip helps me show them that while many things have changed, some never will. In the four months and one week since I’ve started work at SDSU’s Marketing & Communications Department, a number of thoughts have popped into my head – both pertaining to my position and to just being a part of academic life for the first time in a while. So far, I can honestly say that I’ve been overwhelmed by the SDSU experience. In a good way. In a short period of time, I’ve met and worked with faculty members who are both dedicated to their students’ learning and to their craft, eager to show the world what Aztecs are capable of. 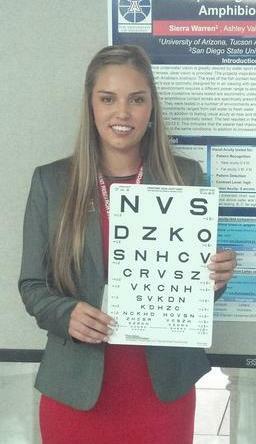 I’ve worked with student interns who are hungry to learn more and excel in a field that is frequently changing. I’ve worked with a local media who seem to be truly interested in all the innovations and discoveries coming out of the laboratories, classrooms and observatories on campus. As someone who served in the armed forces, there is one aspect of San Diego State I took notice of almost immediately. Very quickly, I saw a university ardent in its support of veterans and active duty military, something that hits close to home. Some of the programs and facilities for veterans put in place here on the Mesa are not common anywhere in the U.S., and it makes me proud to be part of SDSU. I’ve come to realize that it’s a privilege to work at San Diego State, among thousands of enthusiastic students, a faculty passionate about their respective fields, and a devoted administration and staff. I may not be an Aztec by degree (don’t hold it against me), but I can say I definitely it’s been a great ride so far and I am proud to be — in some small part — part of the SDSU family. ABC News featured research by San Diego State public health professor Joni Mayer in the story “Stricter Laws Needed to Keep Kids Away From Tanning Beds.” And in part because of her research, in 2012 California will become the first state in the country to ban indoor tanning for teens under 18. “Raising Graduation Rates, and Questions” in Inside Higher Ed featured SDSU’s graduation rates that nearly doubled over 1o years. Associated Press wrote a story on new research from SDSU psychology professor Jean Twenge about today’s college students being more confident than previous generations in “New data on college students and overconfidence.” I can always count on Jean for at least one solid national hit each year! SDSU geology professors Tom Rockwell and the always entertaining Pat Abbott appeared on CNN and Headline News to help explain the uncommon earthquake on the East Coast. They were also interviewed by USA Today and others. ESPN’s story “SDSU studies surf sustainability” featured our new Surf Research Center. Forget the puns, this research is all about doing good in places where surf is a tourist attraction. SDSU launches only the second LGBT major in the nation and the San Diego Union-Tribune comments section lights up! The new Dead Sea Scrolls exhibit in New York City is curated by SDSU religious studies professor Risa Levitt Kohn. She talked about it on NPR last month after being featured in dozens of national publications. And in honor of our “plus one” in this week’s NCAA College Basketball rankings, SDSU’s march to the Sweet 16 in March was probably the biggest SDSU story of the year. But it wasn’t just our student athletes that made a name for themselves in 2011, “The Show” went national and was tagged among the best student section in all of college basketball by ESPN. Jim Herrick is the Executive Director of SDSU’s Alumni Association. This post was originally published in his blog Directly Speaking. This month Marshall is entering the NFL Hall of Fame as a first ballot unanimous pick which gives us all, his fellow Aztecs, a chance to feel some pride in his amazing life. On September 14, 1991 I was at Jack Murphy Stadium, but my various responsibilities precluded me from paying too much attention to the game. I was aware that we were playing Pacific and that we were annihilating them. I was aware that our top runner, T. C. Wright, had gotten injured. I was aware that we were scoring a lot of touchdowns. It wasn’t until much later that night after the boosters had vanished, the corporate sideline placards were dismantled and stored, and the gear stowed that I caught the tail end of the post-game wrap-up on 760 AM. Some rookie named Marshall Faulk had rushed for 386 yards and had scored all 7 touchdowns! Subsequently, along with every other Aztec fan—or any true football fan, actually – I was transfixed by his sheer talent and completely mesmerized and awed by his larger-than-life presence and skill. For 15 years I devoured every game or clip I could because, well, transcendent athletic art is compelling. I never tire of his highlight reel—and it is a heckuva long movie. Some of Marshall’s attributes are just part of an overall amazing package: Speed (obviously), ability to change directions (superb), coordination (duh! ), jumping ability (definitely), ability to catch the ball and his aversion to fumbling are the basic ingredients. But the thing I marvel at the most when watching these clips is his ability to read the best paths to optimize his yardage every play. The speed his eyeballs and his brain processed and reacted to the circumstances, I think, is what made him the best combination of receiver and running back the game has ever known. And it nearly didn’t happen. Many know the story of how Marshall, as a prep player growing up in the dangerous Desiree projects of New Orleans, actually dodged bullets figuratively and literally (Well, dodging bullets probably doesn’t qualify as a literal term, but with Marshall, maybe). The SEC schools were highly aware of his speed and he was pegged by several schools as a cannot-miss defensive back. But Marshall wanted to play halfback and then-coach Al Luginbill and receivers coach Curtis Johnson promised him he could run at San Diego State, so here we are. So a few days after his remarkable freshman year, I remember our sports information department got in some hot water for failing to anticipate the fact that Marshall was named all-America. Marshall’s second year was more of the same with a lot of fans jumping on the band-wagon. As the director of the Aztec Athletic Foundation, I had the honor of dealing with Marshall on a few things including a project where local sports artist Gene Locklear made 100 poster-sized prints that Marshall signed and we sold for scholarship monies. The NCAA rules were intrusive, but following them essential, so I was allowed to provide him a Big Mac, fries and a coke during the 90 minutes he was signing. Subsequently I tried to arrange special parking at the Murph for Marshall and recall that it was impossible to strike a rational balance between providing for Marshall’s safety and abiding by the NCAA laws. But I did get to deal with him on these matters and what I discovered was that Marshall’s ability to communicate is powerful. So now let’s fast forward through his pro career, which will be better covered by others this week, and arrive back a couple of years ago when Marshall retired and moved here full time. What has this remarkable Aztec done since then? Between his jobs as analyst for the NFL Network, he has demonstrated that he is a true fan and has attended many football and basketball games. He started the Marshall Faulk Foundation which steers inner city youth down better roads. He has been a big donor to our athletic department. He was elected to the board of directors of the Campanile Foundation. He has an annual event in the Parma Payne Goodall Alumni Center on the eve of homecoming which draws in hundreds of Aztec and Marshall fans and friends and raises money for us, the Jackie Robinson YMCA and the Marshall Faulk Foundation. It is called the Aztec for Life event. Oh yeah, one more thing (Wait, that was Peter Falk, not Marshall Faulk). Marshall coined the term “Aztec for Life” which just happens to be the San Diego State University Alumni Association mantra. Marshall Faulk, we are proud of your NFL Hall of Fame election. And we are even prouder of everything else you have done. We consider ourselves one big family here on Montezuma Mesa but its pretty cool to have your real siblings around to share in the college experience. All three Haiker siblings are Aztecs and mom Suzanne shared with me the photo for the family’s holiday greeting card this year-boasting their SDSU connection. There’s Brendan (’12) a finance major; Jeanine (’10), who just completed her degree this month in interior design; and the youngest of the Haiker family, Michelle (’14), a freshman studying speech language and hearing sciences. 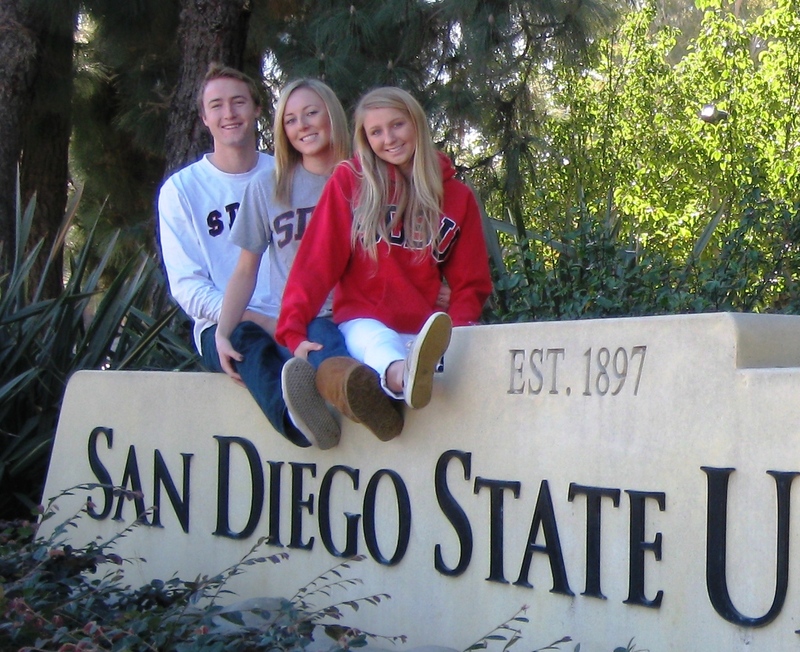 Of course, the Haikers are probably not the only Aztec siblings attending SDSU right now. In fact, we’ve written a number of stories about Aztec families for 360 magazine. At this time of year, we love to celebrate the family we are year round. So happy holidays from our Aztec family to yours- may the season bring you and your loved ones closer together – even if you already see each other every day on the way to class! It’s the number one most frequently asked question on all of our social media sites, and it says a lot more about you than you think. When will I know if I’ve been accepted? It’s a simple question that isn’t always easy to answer. With budget changes adjusting the number of enrollment spaces, thousands of test scores arriving to be processed by the Admissions office, and dedicated evaluators combing over every application, it takes time to determine your application status. What’s more important, at least from our perspective, is what that question says about you as a potential Aztec. There is a reason current students and alumni become Aztecs for life. It’s a pride for a rich campus and university life that starts before any of us are officially welcomed into the Aztec family. We can understand the anticipation in waiting to find out if you will be a student at San Diego State. That excitement and enthusiasm is what makes the SDSU campus culture so connected and dynamic. Aztec pride is cultivated from the time you decide that SDSU just might be the place for you. Use your WebPortal: The SDSU WebPortal is the first place your admissions status will change, so instead of waiting for the mail, simply log on any time during the day. Follow all next steps: SDSU’s Admissions Web site contains next step information for first-time freshmen and transfer applicants to ensure a smooth application review process. Make sure you keep your contact information up to date via WebPortal, send in your SAT/ACT test scores, and get a jumpstart on fulfilling the entry-level testing requirements. Completing everything on your end makes things at the Office of Admissions run a lot smoother and quicker. Pay attention to e-mails from SDSU: E-mail communication from the Office of Admissions often contains important information about the application process. Be sure to read all e-mails from SDSU and follow any next step information or reminders about your application. Get connected: You’re not alone! There are thousands of other applicants waiting for the decision so get connected on common ground. Start discussions on Facebook or Twitter about what you look forward to in college, why you decided to apply to SDSU, or what major you chose.